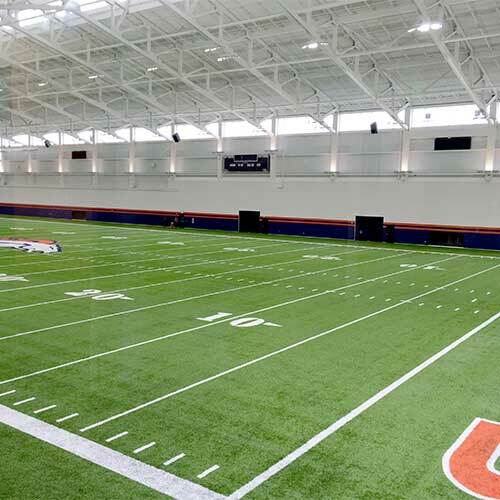 Any single zone space of at least 20,000ft2, with 15-20ft.+ ceilings, is a potential Air-Rotation HVAC candidate. How Does A Johnson Air-Rotation HVAC System Work? Johnson Air-Rotation HVAC Systems use high volume, low velocity, air-circulation to distribute conditioned air to a large open space. We say “conditioned air” because the air in the space may be heated, cooled, humidified, dehumidified or supplemented with outside, fresh air as defined by the requirements of the space. Air Rotation HVAC is a total conditioning system, including general ventilation that results in no stratification, vertical temperature control, low energy and maintenance costs. The general concept of Air-Rotation HVAC (sometimes referred to as air turnover) is to return all the air in the space to an Air-Rotation unit a sufficient number of times per hour to ensure an even distribution of the conditioned air. This concept provides for an even temperature distribution of the conditioned air product. Throughout the building, the temperature will not vary by more than +-2 degrees Fahrenheit from a set point and more frequently will only vary by 1 degree Fahrenheit. Additionally, the measured temperature variation throughout the building height will typically indicate a maximum 2 degree temperature rise for every 10 feet of elevation increase. The Johnson Air-Rotation HVAC System is designed to pull the return air in at floor level by means of a continuously circulating fan system. The return air section has a thermostat that measures air temperature. When the thermostat detects the requirement to add building heat, for example, the heat module directly above the Air Mover Module will function to heat the air. The discharge air is passed on to an air outlet where it is directed into the space, typically near the ceiling. The heated air is a low temperature product, generally only 20 degrees Fahrenheit above the thermostat set point. This low temperature air, when delivered to the space, will mix better with the existing ambient air and will not stratify as easily as if it were delivered at a high temperature. Learn More About Johnson Air-Rotation HVAC Systems By Clicking The Play Button Below! Why Use Johnson Air-Rotation HVAC Systems? Johnson Air-Rotation HVAC eliminates much of the infrastructure needed for more conventional systems. These grade mounted, vertical air handlers are maintained from ground level, making maintenance easy. Johnson introduces conditioned air near the roof deck that returns at the ground and uses efficient prop fans. In many applications, temperature and humidity design criteria are critical, meaning consistency is a must. What Can The Johnson Air-Rotation HVAC System Do? Johnson Air-Rotation HVAC Systems are designed to project air up to 400 feet from the heat source and 350 feet from the cooling source. One Johnson Air-Rotation System can effectively heat approximately 150,000 square feet and cool up to 125,000 square feet. 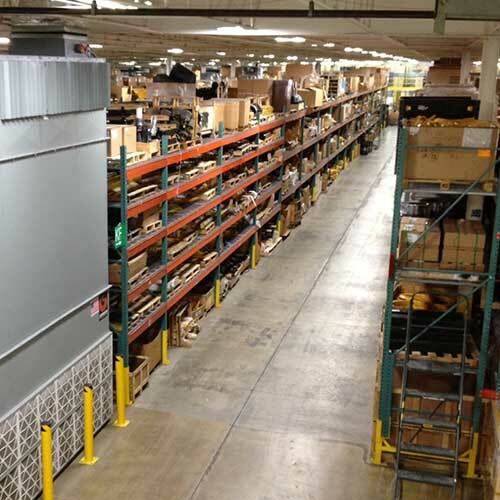 We provide our systems with a custom-designed air outlet for each space that can directionally project the conditioned air out over the tops of storage racks, etc., where it gently drops down into rack aisles and these aisles then become our invisible return air ducts. For this reason it is necessary to have a certain minimum height for the Air-Rotation / air turnover principle to work properly. If the building is less than 12 feet in height or has a poor height to width and length ratio, the Air-Rotation system cannot physically be built high enough to project the air away from the unit and it will “short cycle” and not condition the building properly. The Johnson Air-Rotation HVAC System is the best choice for high ceiling, large cubic content buildings, generally anything above 50,000 square feet. Johnson Air-Rotation HVAC Systems can be fully customized to meet any building’s unique requirements. Whether a system requires a chilled water coil, steam heat, dehumidification, or stainless steel, Johnson Air-Rotation Systems can be configured to meet your custom requirements. How Do I Explore Air-Rotation On My Project? Johnson has an in-house engineering team to help design your entire project. Our inside engineering team will assist in running loads, system layout, unit configuration, and system optimization for your particular needs.